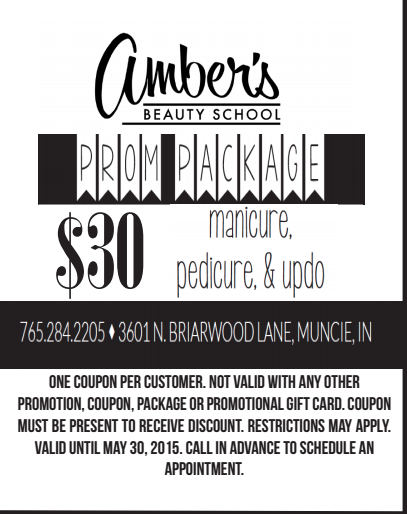 Like last year, Amber’s will be offering a prom package with discounted services for April and May! The difference this year, though is an extra discounted price! We dropped the price for a combined three services to $30. After making an appointment, prom-goers are invited in to get a pedicure, a manicure and a hairdo. The benefits of our prom package include saving money, getting everything done at once, and having the space in our facility to come in with a large group of friends to get your hair and nails done together! Print out the prom coupon and make an appointment in advance to ensure we will have a stylist ready for you when you get here.